Turning a shirt into a dress will work with any size kids shirt. Cut the shirt about 1 inch below the bust line or 2 inches below the armhole. Lay your shirt down and measure the width of the bottom of the shirt. Double the measurement from the shirt and this will be the width of your skirt. Measure from the armhole to the desired length of the dress. Subtract 1 inch. This will be your length of the skirt. Pick a piece of material that coordinates with your shirt and cut out 2 pieces measuring from the desired length and width. With right sides together, sew the two rectangles together along the sides. On the top of the skirt do a gather stitch about 1/2 inch below the edge. Do another gather stitch right below the first one. Doing two rows of the gather stitch will allow for an extra, if one row breaks. 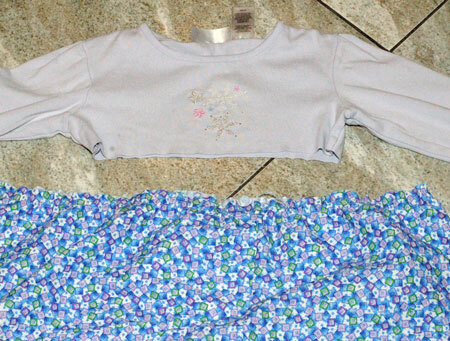 Gather the skirt to fit the size of the shirt. Be careful not to pull too hard or your thread will break. Try and keep the gathers even all the way around the skirt. Pin the skirt seams to match up with the arm seams on the shirt. Place right sides together. 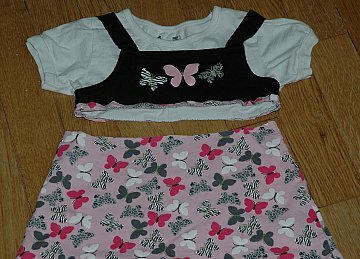 Shift and gather to fit the skirt and shirt together. Pin in place. Sew together. Turn the bottom of the skirt up 1/2 an inch and then 1/2 an inch again. Pin. Hem. 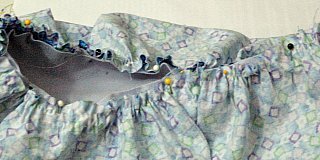 Hem is what it is called when you sew the edge to finish it. 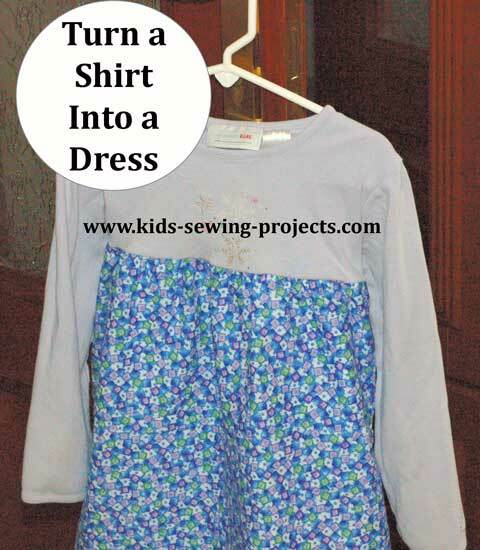 You can create an easy kids dress by using this same idea for a shirt that no longer fits over the head. 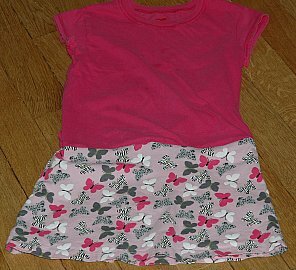 Cut off the bottom of the shirt and attach to a different shirt, creating a dress or longer shirt. Back to projects index from sewing a Shirt into a Dress.